New Orleans loves to drink; that much has never been disputed. The cause for debate comes from where exactly to drink. More often than not, hotel bars are tossed to the wayside as not worthy of a local’s time. However, some of the best and most interesting watering holes in town can be found in hotels -- from swanky cocktail bars and relaxing poolside retreats, to even a working carousel (just don’t spill your cocktail). The view from the patio terrace looking out onto the historic St. Charles Streetcar Line should be enough to convince you to check out The Columns' Victorian Lounge. If not, the drinks inside will. Within the mahogany-paneled walls (imported from Honduras, no less) and under the gorgeous brass chandeliers, patrons can try some great versions of classic cocktails, along with originals like the St. Charles Breeze (cucumber, muddled mint, lime, Hendrick’s gin, Chartreuse, Sprite, and tonic water) and the Louisiana Sunrise (made with muddled mint, Cointreau, Stoli vodka, ginger beer, and fresh fruit juice). The bar itself once served as a family dining room, and that homey feel still permeates the lounge area, so visitors might find it difficult to leave after a couple drinks. How many bars are situated within a working merry-go-round? 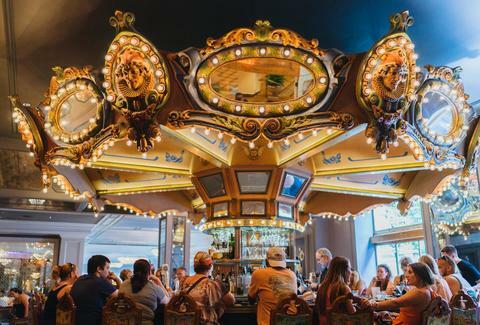 Since 1949, the Carousel Bar has lazily rotated beside the hotel lobby while seating countless famous patrons. The room was expanded a few years back to accommodate more visitors, and now even includes a standalone bar (for those prone to motion sickness, of course). Wherever you choose to order a drink, be sure to sample the original Vieux Carre cocktail, made with Cognac, Benedictine, rye whiskey, sweet vermouth, and a twist of lemon along with Peychaud's and Angostura bitters. 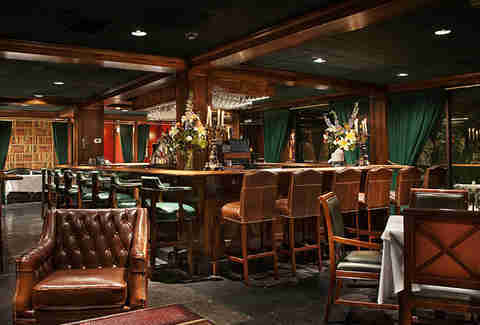 For over 20 years, The Bombay Club has been the go-to for martinis in town. It offers more than 50 varieties, along with other drinks ranging from pre-Prohibition mainstays to newer concoctions. Hide out in one of Bombay Club's more private alcove booths while enjoying live jazz and small plates from the kitchen, which fuses Cajun cooking with traditional British fare. Bourbon "O" Bar offers respite from the madness of Bourbon Street, and is mainly known for its perfect take on mainstay cocktails, along with the opportunity to try a classic absinthe drip fountain. While waiting for a six- or 12-minute Ramos' Gin Fizz (literally mixed and shaken for that long, per a Crescent City recipe dating back to 1888), visitors can sip on one of a number of local draft beers while watching out the window as Bourbon Street novices stumble over themselves. The Rooftop Bar is perfect for the dog days of summer when the humidity is almost too much to bear. Cool off in Rooftop’s waters, lounge in one of its cabanas on the rooftop terrace, and gaze out at the New Orleans cityscape with an amazing tropical cocktail in hand. Particularly worth trying: the Moscow mule, mai tai, and original "Frozevelt" (made with citrus vodka, lime juice, and marasca cherry syrup). The bar also has a large snack menu Thursday through Sunday. Public Belt is a newer establishment, but it owes a fair amount of its class to bygone eras of the city (including its name, a nod to a 1900s-era railroad line). Against a background of live jazz, Public Belt offers classic cocktails and modern drinks inspired by turn-of-the-century prostitutes and madams. The Scarlet Harlot combines Patron Silver tequila, dry vermouth, lemon juice, and apricot liqueur, while Ella's Sinful Secret features St-Germain, Boodles gin, dry vermouth, and celery bitters. Only open for a couple years, this bar has racked up a number of local "Best Of" awards. The atmosphere is a bit more refined to fit with the smaller boutique lodging and modern metallic decor of the lodge. But with five-dollar high balls and a rotating specialty list during the daily happy hour, it's hard to stay away. 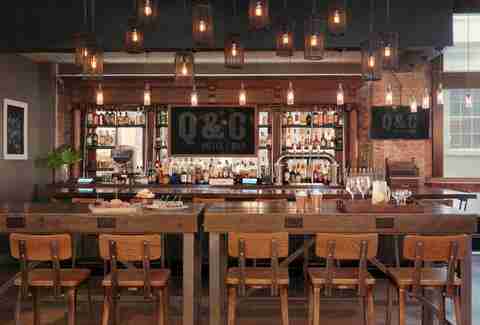 Q&C's kitchen also offers some pretty hefty bar food, including a ridiculous house burger featuring arugula and Boursin cheese, as well as a decadent charcuterie plate. It doesn't get much fancier than the Davenport Lounge. Named after the Grammy award-winning jazz trumpeter and vocalist Jeremy Davenport, the posh third-floor bar serves a bevy of classic and newer cocktails to hotel guests and locals alike. Jeremy himself performs with a full band four nights a week, and you never know who might be sitting in the audience or onstage (Paul McCartney and Kevin Hart have been spotted at the Davenport). To nurse whatever headaches might ail you the next day, the Lounge also offers afternoon tea times daily for when you finally tumble out of bed. 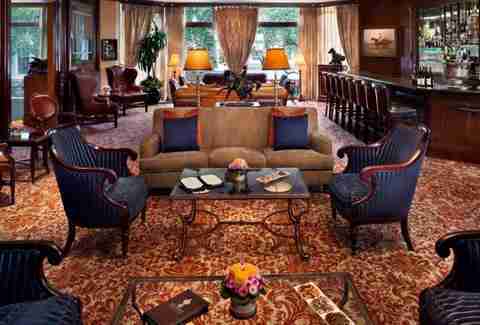 Polo Club Lounge looks and feels about how it sounds -- dark wood, equestrian motifs, plush cushioning, and stiff drinks reminiscent of a classic English country club. While Polo Club doesn't skimp on cocktails, you'd be wise to look at their wine menu, which features over 600 labels. The bartenders know their stuff, too, and will be happy to help make a decision if it all becomes a bit too overwhelming. Although the Lounge is currently closed for renovations until mid-September, it will be well worth the wait when it reopens. Located on the 11th floor of Canal Place, the Central Business District's high-end shopping center, this is an excellent place to get away from the busy foot traffic on the streets below. Try the signature Cucumber Bloody Mary or Bubbly Martini (or one of both), then strike up a game of backgammon or chess. If you’d like to relax with your drink, grab one of the high-top tables overlooking the river's barge and ship traffic. The view alone is worth a visit, but the drinks and low-key atmosphere is enough to make you think about booking a room. Andrew Paul is a freelance writer based in New Orleans who has become extremely familiar with the city's bar offerings. Follow him on Twitter @anandypaul.